2014 / 2015 Sunfish Angler Education. Enter the keywords you wish to search for. This year the weather was considerably more favourable to us. Kid’s Fishing Days were run covering coastal, estuarine, fresh water and impoundments. These events were attended by 1283 kids, 308 instructors and coaches and 554 parents and carers. Each child attending received tackle specific to the local conditions. There were taught how to both use that tackle and care for it. On the days, lunch was provided and varied from the traditional sausage sizzle to red claw on the barbie caught that day. It is impossible to pick out a group that had the most fun. Smiles were enormous on all the faces. In this report I have included a selection of the individual reports from events. From the photos you can see that there was a large cross section of children covering, boys and girls, indigenous and also those from socially, physically and emotionally disadvantaged sectors. For those last three groups, these days are probably the most important. As an aside, modules from our Level 1 Instructor’s course, that include the templates on which our kid’s fishing days are run have this year been included in the national angler education resource database. Sunfish Queensland wishes to acknowledge the valuable support provided by the provision of this grant funding. Educating our next generations on the valuable resource that they need to protect is extremely important. Equally important is the ability to pass traditional knowledge and skills onto children that may not have those in their family networks that are able to do so, given the changing demographics in our society. We also can’t forget the tremendous opportunities provided for families with children who have difficult circumstances. These families are discovering a pastime that they can enjoy as a unit, irrespective of physical or emotional disadvantages. Kids Fishing Day area the jewel of Sunfish’s activities. These young minds soak up all the skills and messages that can be delivered to them. We certainly appreciate that Fisheries Queensland also acknowledge the value in nurturing this conduit back into communities by continuing to support this program. As you can see from some of the emails that have been included, these communities look forward to these events every year. It is a great testament to our volunteers that they keep their enthusiasm going year after year. Feedback from attendees, parents, carers, coaches and instructors was unanimously supportive and constructive. In that vein I need to forward on the thanks to Fisheries Queensland and the Minister that were directed through us on the value of this program to their communities. Below are the photos and files available for this article. FiLES AVAiLABLE FOR DOWNLOAD Click on any icon to download that file. The download will start from a popup window, so please allow popups. 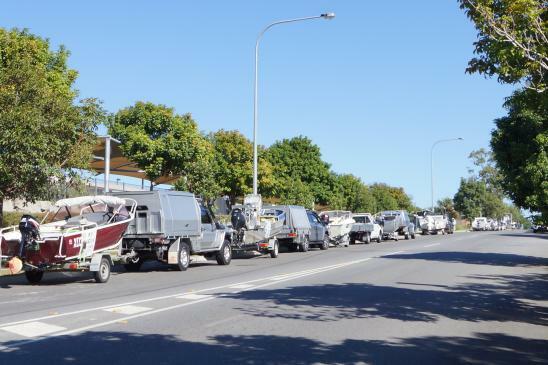 A group of very concerned recreational fishers got their boats ready on Friday and met at Blue Fins Fishing Club Inala to voice their significant worries about reductions to their existing catch possession limits and then proceeded to convoy onto the Premiers electorate office in Richlands. Recreational fishers have been supporting the current Sustainable Fisheries Strategy. They, like many others, including Fisheries Queensland believe that the current fisheries management protocols are many years past being overhauled. The current system is strongly based on an antiquated perception that there are never too many harvesters on the water. We now have a commercial fishing industry that has far too many operators that are using their licences only during spawning aggregations to top up their other incomes because there are too many of them to all have profitable fishing businesses. What was expected was that a line wold be drawn in the sand and for each species the existing data would be used to calculate current catch share amongst all sectors: commercial, recreational, indigenous and conservation (theirs stay in the water?). If a species was then identified as in trouble everyone would take an equal hit based on their catch share. However, in the last week it has become apparent that within Fisheries Queensland there is a separate personal agenda being driven very forcefully to reallocate a considerable portion of the existing recreational catch to the commercial sector before the starting gate has even opened. Small meetings have been held across the state where total possession limits of 3 mud crabs or 15 fish of a species have been very heavily pushed by Fisheries Qld staff. This contradicts the information put out by the department in the discussion papers. With funds provided by Fisheries Queensland we were once again able to conduct our Kid's Fishing Program. Due to their popularity we needed more instructors so ran our 12th Level 1 Angler Education Course. This year our Level 1 Angler Ed Instructor Course saw 12 new instructors complete their training. The course was held at Kedron Wavell Services Club and all graduates have since run respective events. This program we saw 1374 children attend an event with 776 parents or carers assisting and 321 coaches and instructors. We have now seen 30 events run across Moreton Island, Caloundra, Croydon, Georgetown, Toowoomba Barra Farm, Lake Cooby, Charters Towers, Camooweal, Julia Creek, Mt. Isa, Tin Can Bay, Paradise Dam, Bribie Island, Wivenhoe, Deception Bay, Roma St Parklands, Callide Dam, Southport, Quart Pot Creek, Raby Bay, Hayes Inlet, Paradise Point and Dawson River. As you can see they cover saltwater and freshwater and range from south east Queensland to the far north, the Gulf and the west. The events run have been located across the length and breadth of the State and have also penetrated into most socio-economic groups. It was a great year with respect to favourable weather and attendance. It was also encouraging to see new organizations running events. Here you can download Sunfish Queensland Lesson Documents. 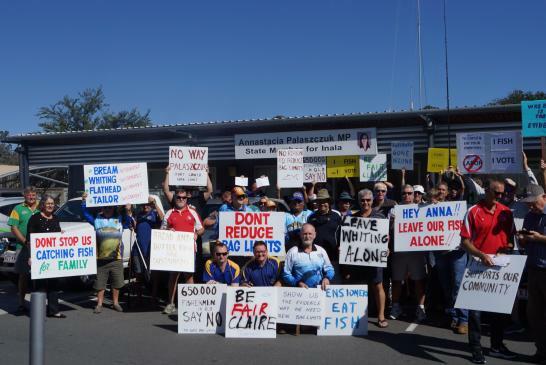 Sunfish Queensland supports the review into the management protocols of Fisheries Queensland. We do however believe that our fisheries stocks are generally in good health when compared in an international context. To maintain the healthy stocks and improve those in lesser abundance management of our fisheries needs to move forward and not cling to processes of the past. We support the vision, goals and areas of reform proposed but the greatest challenges will be resourcing, data, community acceptance and keeping the reform external to the election process. Our commercial fisheries need to be overhauled so that they have less operators and they are redesigned to better operate in a consumer environment that has a strong focus on socially and environmentally sustainably caught seafood. This will help to ensure greater profitability within commercial fisheries for the operators and make the career of “commercial fisherman” a viable career choice.